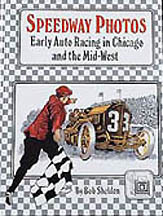 This volume includes a brief synopsis of auto racings beginning in Chicago plus facts of all kinds relating to racing throughout the years. Visit race tracks across the country, meet a wide variety of drivers  some well-known and others you may not be familiar with. Features photos from the early 1900s through the 1950s. A must-have for racing history buffs.